What’s remarkable about Barry Jenkins’ Moonlight is that it’s hardly remarkable at all. It’s actually mundane, though its mundanity can be mitigated—or, really, delineated—via qualifiers: buoyant, bitter, graceful, beautiful, harsh, coltish, doleful, vibrant. More to the point: Moonlight is familiar. If you strip away its exterior particulars, you’ll be left with the bones of a coming-of-age story. (And if you’re into fancy European labels, you might call that story a “bildungsroman,” wherein the principal character’s emotional growth is traced over the course of formative years, even decades.) Every film has a skeleton to support its musculature. Moonlight’s just happens to look like Boyhood’s and The 400 Blows’. And yet, Moonlight plays around with the passage of time in its protagonist’s life, but it isn’t Boyhood. It also isn’t The 400 Blows, even though Jenkins borrows that film’s final shot as the capper for his. Instead, Moonlight is Moonlight, Jenkins’ personal coming-of-age vision, a film that’s all about growing up black in Miami, an experience he shares in common with playwright Tarell Alvin McCraney, whose play In Moonlight Black Boys Look Blue provides the basis for Jenkins’ own production. Jenkins is straight. McCraney is gay. 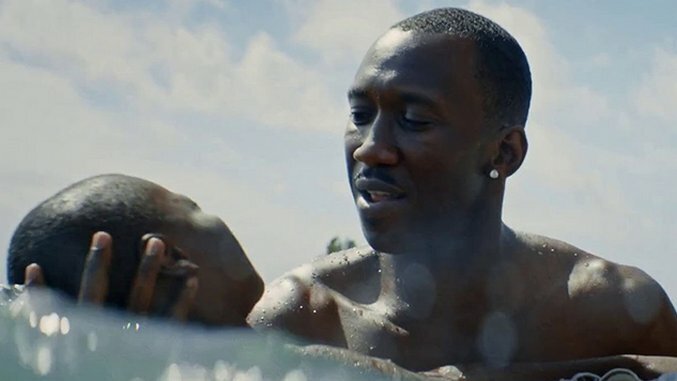 Moonlight is the corner where their lives intersect, where the details of Jenkins’ upbringing meld with McCraney’s, and thus makes discerning where one man’s story begins and the other’s ends a tricky feat. Don’t bother untangling those specifics, though. Jenkins’ creative union with McCraney lends Moonlight a seamless universalism: The implicit statement is that their story is the story of many a black youth living in the Magic City, though of course the film has a focal point in its protagonist, Chiron—“Chi” like “shy,” “ron” like the Rhône—played by a trio of actors across three different segments set in three separate periods of his life, each titled using the appellations best suited to him from one chapter to the next: “Little”; “Chiron”; “Black.” He is portrayed as a child by Alex Hibbert, as a teen by Ashton Sanders and as a man by Trevante Rhodes, each bringing singular quiet flourishes—emphasis on “quiet”—to Chiron’s reserved persona while still maintaining a consistent individualism. Their ensemble performance is an impressive achievement, but it’s an achievement that’s nearly impossible to articulate. Moonlight is painted with brushstrokes of silence: of Jenkins’ unobtrusive direction, of Chiron’s mute trepidation, of his friends and caregivers, who speak to him in the knowledge that he’ll say little and less to them in return (if he says anything at all). The film’s loudest components tend to be the sources of Chiron’s torment, whether it’s his drug-addicted mother, Paula (Naomie Harris, fracturing as easily as a porcelain doll), or his bully, Terrel (Patrick Decile). Nothing, of course, causes him as much turmoil as his uncertainty of self, and that element is rendered chiefly in tones of hushed apprehension. Rather than make Moonlight inaccessible, silence opens it up. In film, silence is neither mortal nor venial sin—it’s actually a virtue. Jenkins is fluent in silence and possesses an innate understanding of how silent moments can communicate more than heaps of dialogue. It’s in glances that pass between Little and his surrogate custodians, Juan (Mahershala Ali, damn near ubiquitous in 2016 and at his best here) and Teresa (Janelle Monáe), the stillness Chiron responds with when in conversation with his chum-then-crush, Kevin. Kevin, like Chiron, is the product of an acting trinity’s combined efforts, from boy (Jaden Piner) to teen (Jharrel Jerome) to man (André Holland, a standout in a group of standouts). He’s also the first person Chiron has any sexual contact with, and ostensibly one of the only people who follows from Moonlight’s second to third section. Their relationship is made complicated by schoolyard survival tactics. In one sequence, Terrel invokes an old hazing ritual to goad a reluctant Kevin into beating Chiron, who refuses to submit either to Kevin’s onslaught or his pleading. Kevin begins telling Chiron to just stay down. Chiron replies with a stare that suggests a mafioso explaining why a kiss is necessary to his capo, imparting his anger and confusion and isolation with clarity enough to rattle the viewer’s soul. It’s a wonder that he and Kevin are able to reconnect at all in their 20s, though that wonder is integral to the melancholy magic of Moonlight’s third part. (Forgiveness is one of the denouement’s major, cathartic themes.) The film doesn’t want to break hearts or indulge ennui, but it does want to leave you shaken by simply reminding you that once upon a time, you too were bewildered or wounded by childhood’s social politics, you too were doubtful and insecure of your identity. It’s a necessary step in fostering empathy, and Moonlight is nothing if not empathetic. But describing the film solely in terms of empathy is a misguided oversimplification: All movies seek out empathy to degrees, after all, and so Moonlight does what any human story on celluloid has to do. Jenkins opts for sensation in favor of the sensational, eschewing flash and bluster while making old hat feel new again. Most of all, he invites our empathy at the cost of our vanity. He leads us away from navel-gazing to see the stunningly constructed drama he and his troupe have laid before us on screen. The film encourages self-reflection, but not at the expense of either its narrative or the viewing experience. That’s the surest sign of a deft cinematic hand. In turn, this isn’t simply Jenkins’ sophomore effort—it’s the defining pivot of his career, and one of 2016’s most essential pictures.